Danielle and Chad became husband and wife with their nuptials at Sea Breeze Point. Located behind the Boardwalk Resort at Walt Disney World this location is perched on the shore of Crescent Lake, across from Disney’s Yacht and Beach Resorts. Danielle’s colorful bouquet and Chad’s matching boutonniere were actually flowers made of wood by Rose and Bee Organics. 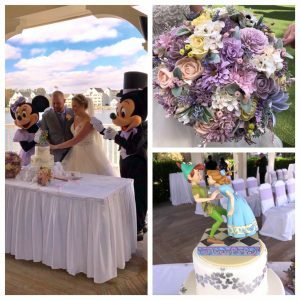 Disney Fine Art Photography captured every moment of the couple’s day. From their getting ready shots, photos along the Boardwalk, to their ceremony, and their first kiss as husband and wife. Rob with the Disney Entertainment Group played the violin as the Dannielle walked down the aisle. Rev.Glynn Ferguson with Sensational Ceremonies worked with the couple to create a one of a kind, custom ceremony. He gave them a homework assignment to write and say why they love each other. We’re all a little weird, and life’s a little weird. Chad wrote: Why do I love Danielle? Where do I begin. A lot of people talk about love at first sight. Now I don’t give me wrong she is an absolutely beautiful girl. But for me it is not all about looks. For me it was a bout love after our first real conversation. The second time I get the pleasure of being with Danielle we spent our night sitting on the couch and just talking for seven hours. It was after that conversation that I knew I was going to spend the rest of my life with her. I’m not really sure what it was, we just clicked. I had never felt like that before. Come to find out it was the true love I have a long for. now after spending the last six months with her I found out that it was so much more. I absolutely love everything about her. I love her smile. It is the most beautiful site in the world. I love her laugh. It is absolutely melts my heart. I love that I can be myself around her. Let’s be honest, I’m kind of a weirdo and I love the fact that I can be be around her. I love that she feels she could be herself around me. I love her for her dog Reggie. That shows me that she’s got to be the kind of mother she’s going to be for my children. I love her passion for starting a family. I want that more than anything. I love her drive we’re having a great life together. I love that we have the same goals in our life. I can’t wait to achieve these goals together and most of all I just absolutely love Daddio. She is my world. I am who I am because of her. I can’t wait to see what this crazy world has a store for us. This is The beginning of our fairytale. We wish them their happily-ever-after!